Years ago, Jodi Canton and Sheriff Gabriel Beckett were torn apart by a shocking murder and false conviction. Can they now face the true killer and rekindle the love they thought they’d lost? Master Sergeant Harry Lockheart was the only survivor of the IED that killed his team—but he credits Daisy Gunderson’s kind letters to his actual recovery. And now that he’s finally met the woman of his dreams, he’s not about to let a stalker destroy their dreams for the future. Rainier Fitzgerald manages to attract both a heap of trouble and the attention of his parole officer, Laura Blade, only hours after his release. Can the two of them crack the cold case on Dunrovin ranch or will Christmas be behind bars? 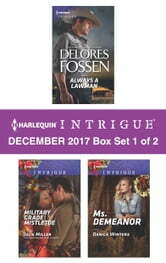 Look for Harlequin Intrigue’s December 2017 Box set 2 of 2, filled with even more edge-of-your seat romantic suspense!